This article is Part Two of a series. For Part One , Click Here. The first patient, Joan a 63 year old English teacher, was diagnosed with breast cancer in 1989, declined conventional treatment, and took 50 mg per day of Iodoral, (Iodine). Six weeks later, a PET scan (left image) showed, “all of the existing tumors were disintegrating”. 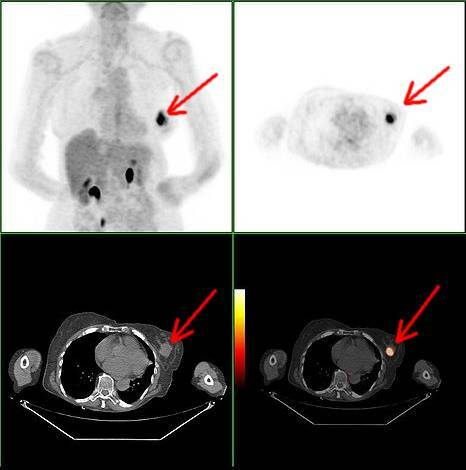 Upper Left Image: Upper two frames is a PET scan showing breast cancer )(red arrows). Lower two frames is a CAT scan showing enhancing breast cancer mass, red arrow. Courtesy of Wikimedia Commons. The second patient, 73 year old Delores, was diagnosed with breast cancer in 2003. She declined conventional treatment with radiation and chemotherapy. Instead, Dolores took 50 mg of Iodoral daily. A follow up ultrasound of the breast 18 months later showed,” It appears that these malignancies have diminished in size since the last examination. Interval improvement is definitely seen,” Two years later a follow up mammogram and ultrasound failed to show any abnormality and were read by the radiologist as normal. 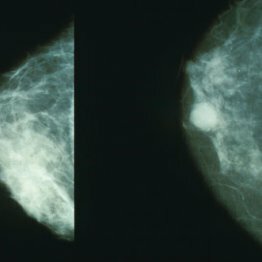 Left Image: Mammogram showing breast cancer courtesy of wikimedia commons. Current Iodine research calls for use of molecular Iodine for all patients with breast cancer. (10)(11) Other cancers such as lung and prostate may also benefit. Further research on Iodine as cancer chemotherapy should receive top priority for NIH funding. Iodine (Iodoral ) is available on the internet without a prescription. Disclaimer: This article is not intended as medical advice. Make sure to discuss with your doctor and follow your own personal doctor’s recommendations when contemplating any changes to your diet, medications, or medical treatment programs. The iodine-induced apoptotic mechanism was studied in MCF-7 cells. DNA fragmentation analysis confirmed internucleosomal DNA degradation. Terminal deoxynucleotidyl transferase-mediated dUTP nick-end labeling established that iodine induced apoptosis in a time- and dose-dependent manner in MCF-7 cells. Mol Cancer. 2009; 8: 33. Published online 2009 June 6. This report confirms our previous observations that I2 treatment reduces mammary cancer incidence , decreases the proliferative rate (PCNA), and induces apoptosis (TUNEL and caspases) in cancerous mammary cells in vitro [14,15] or in vivo without any secondary adverse effect on the thyroid or general health . Our previous observation that tumor growth resumes if I2 treatment is suspended. .
Several studies have demonstrated that moderately high concentrations of molecular iodine (I2) diminish the symptoms of mammary fibrosis in women, reduce the occurrence of mammary cancer induced chemically in rats (50–70%), and have a clear antiproliferative and apoptotic effect in the human tumoral mammary cell line MCF-7. Nevertheless, the importance of these effects has been underestimated, in part because of the notion that exposure to excess iodine represents a potential risk to thyroid physiology. In the present work we demonstrate that uptake and metabolism of iodine differ in an organ-specific manner and also depend on the chemical form of the iodine ingested (potassium iodide vs. I2). Further, we show that a moderately high I2 supplement (0.05%) causes some of the characteristics of the ‘‘acute Wolff-Chaikoff effect’’; namely, it lowers expression of the sodium=iodide symporter, pendrin, thyroperoxidase (TPO), and deiodinase type 1 in thyroid gland without diminishing circulating levels of thyroid hormone. 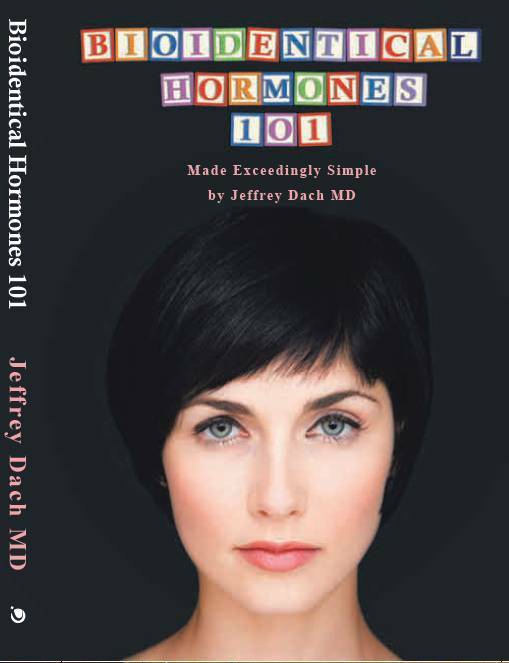 health (e.g., body weight, thyroid economy, or reproductive cycle). Thus, we propose that I2 supplementation should be considered for use in clinical trials of breast cancer therapies. Uptake and antiproliferative effect of molecular iodine in the MCF-7 breast cancer cell line. C Aceves et al. Querétaro, México. In conclusion, these results demonstrate that I2 uptake does not depend on NIS or PDS; they suggest that in mammary cancer cells, I2 is taken up by a facilitated diffusion system and then covalently bound to lipids or proteins that, in turn, inhibit proliferation. Signaling pathways involved in the antiproliferative effect of molecular iodine in normal and tumoral breast cells: evidence that 6-iodolactone mediates apoptotic effects. C Aceves et al. Querétaro México. Previous reports have documented the antiproliferative properties of I2 and the arachidonic acid (AA) derivative 6-iodolactone (6-IL) in both thyroid and mammary glands. In this study, we characterized the cellular pathways activated by these molecules and their effects on cell cycle arrest and apoptosis in normal (MCF-12F) and cancerous (MCF-7) breast cells. Low-to-moderate concentrations of I2 (10–20 µM) cause G1 and G2/M phase arrest in MCF-12F and caspase-dependent apoptosis in MCF-7 cells. In normal cells, only high doses of I2 (40 µM) induced apoptosis, and this effect was mediated by poly (ADP-ribose) polymerase-1 (PARP1) and the apoptosis-induced factor, suggesting an oxidative influence of iodine at high concentrations. Our data indicate that both I2 and 6-IL trigger the same intracellular pathways and suggest that the antineoplasic effect of I2 in mammary cancer involves the intracellular formation of 6-IL. Mammary cancer cells are known to contain high concentrations of AA, which might explain why I2 exerts apoptotic effects at lower concentrations only in tumoral cells. Seaweed Prevents Breast Cancer? Hiroomi Funahashi et al. Japan. used in daily drinking water, without toxicity. In vitro, mekabu solution strongly induced apoptosis in 3 kinds of human breast cancer cells. These effects were stronger than those of a chemotherapeutic agent widely used to treat human breast cancer. Furthermore, no apoptosis induction was observed in normal human mammary cells. In Japan, mekabu is widely consumed as a safe, inexpensive food. Our results suggest that mekabu has potential for chemoprevention of human breast cancer. Iodine Alters Gene Expression in Breast Cancer Cells. The protective effects of iodine on breast cancer have been postulated from epidemiologic evidence and described in animal models. The molecular mechanisms responsible have not been identified but laboratory evidence suggests that iodine may inhibit cancer promotion through modulation of the estrogen pathway. To elucidate the role of iodine in breast cancer, the effect of Lugol’s iodine solution (5% I2, 10% KI) on gene expression was analyzed in the estrogen responsive MCF-7 breast cancer cell line. Microarray analysis identified 29 genes that were up-regulated and 14 genes that were down-regulated in response to iodine/iodide treatment. The altered genes included several involved in hormone metabolism as well as genes involved in the regulation of cell cycle progression, growth and differentiation. We assessed a nonradioactive approach to induce apoptosis in non-small cell lung cancer by a novel iodide uptake and retention mechanism. To enhance tumor apoptosis, we transduced non-small cell lung cancer cells with retroviral vectors containing the sodium iodide symporter (NIS) and thyroperoxidase (TPO) genes. Expression of NIS and TPO facilitated concentration of iodide in tumors. As a consequence of the marked increase in intracellular levels of iodide, apoptosis was seen in >95% of NIS/TPO-modified lung cancer cells. Intraperitoneal injection of potassium iodide resulted in significant tumor volume reduction in NIS/TPO-modified tumor xenografts without apparent adverse effects in SCID mice. Iodide induced an increase in the level of reactive oxygen species. Iodide-induced apoptosis is sensitive to N-acetylcysteine inhibition, suggesting an important role by reactive oxygen species in this apoptotic process. In addition, iodide-induced apoptosis is associated with overexpression of CDKN1A (p21/Waf1)and down-regulation of survivin at both mRNA and protein levels. This is the first report demonstrating that a therapeutic dose of nonradioactive iodide has potent efficacy and high selectivity against lung cancer when used in combination with genetic modification of cancer cells to express the NIS/TPOgenes. J Natl Cancer Inst. 1993 Aug 18;85(16):1342-3.
increase in any adverse event was observed. Previous studies [2,3] that showed both increased goiter rates and increased prevalence of thyroid enlargement by ultrasound in patients with breast cancer . It has been postulated that formation of iodolipids such as iodolactones or iodoaldehydes represents a form of thyroidal autoregulation , which may be the mode of action of iodide inhibition of thyroid function in the Wolff–Chaikoff effect [27-29]. In addition to their role in inhibiting thyroid function, these compounds may act as antiproliferative agents in the thyroid . Can J Surg. 1993 Oct;36(5):453-60. Iodine replacement in fibrocystic disease of the breast. Ghent WR, Eskin BA, Low DA, Hill LP. Department of Surgery, Queen’s University, Hotel Dieu Hospital, Kingston, Ont. OBJECTIVE: To determine the response of patients with fibrocystic breast disease to iodine replacement therapy. CONCLUSIONS: Molecular iodine is nonthyrotropic and was the most beneficial. Extrathyroidal Benefits of Iodine by Donald W. Miller, Jr., M.D. PART 3: WHAT IS THE EFFECT OF IODINE ON BREAST CANCER? Results: A 58-fold increase in iodide uptake was observed in infected MUC1-positive T47D cells with no significant increase observed in MUC1-negative MDA-MB-231 cells or in cells infected with the control virus. The in vivo study yielded clear images of Ad/MUC1/NIS-infected tumor xenografts using 123I. Administration of a therapeutic dose of 131I resulted in an 83% reduction in tumor volume, whereas control tumors continued to increase in size (P < 0.01).